For discussion on the latest changes to Charles, please see Karl’s blog. Charles 4.2.8 released with minor bug fixes. Read more. Charles 4.2.7 released with minor bug fixes and improvements. Read more. Charles Security Bulletin for a local privilege escalation in Charles 4.2 and 3.12.1 and earlier. Read more. Charles 4.2.5 released with major bug fixes and minor improvements. Read more. Charles for iOS released. Read more. Charles 4.2.1 released with important bug fixes. Read more. 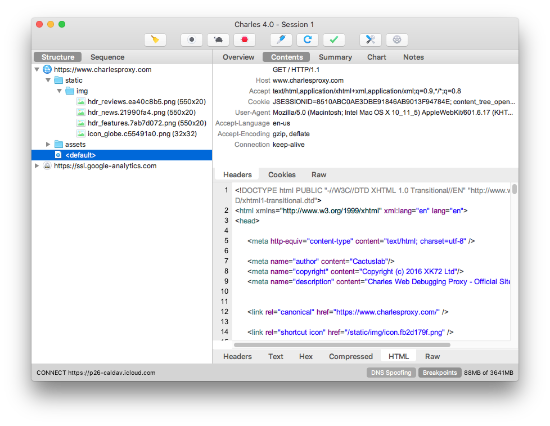 Charles 4.2 released with major new TLS debugging capability, minor improvements and bug fixes including macOS High Sierra support. Read more. Charles 4.1.4 released with minor improvements and bug fixes. Read more. Charles 4.1.3 released including Brotli compression support and other minor bug fixes and improvements. Read more. Charles 4.1.2 released with bug fixes and minor improvements. Read more. Charles 4.1.1 released with bug fixes. Read more. Charles 4.1 released including major new features and bug fixes. Read more. Charles 4.0.2 released including bug fixes and minor improvements. Read more. Charles 4.0.1 released including bug fixes. Read more. Charles 3.11.6 released with support for macOS Sierra and minor bug fixes. Read more. Charles 4 released featuring HTTP 2, IPv6 and improved look and feel. Read more. Charles 3.11.5 released including minor bug fixes; especially fixes SSL certificate installation on Android. Read more. Charles 3.11.4 released with support for ATS on iOS 9 and crash fixes for older versions of Mac OS X. Read more. Charles v3.11.3 released including bug fixes and minor improvements. Read more. Charles v3.11.2 released with SSL and Websockets improvements. Read more. Charles 3.11 released including major new features. Read more. Charles 3.10.2 released with bug fixes and improvements. Read more. Charles 3.10.1 released with minor bug fixes. Read more. Charles 3.10 released with improved SSL (new SSL CA certificate install required), major new features and improvements. Read more. Charles v3.9.3 released with improvements to SSL support, Mac OS X Yosemite support and other minor bug fixes and improvements. Read more. Charles v3.9.2 released with minor bug fixes. Read more. Charles 3.9.1 released with minor bug fixes and improvements. Read more. Charles 3.9 released with major new features and bug fixes, including the ability to "focus" on hosts so they are separated from the noise. Read more. Charles 3.8.3 released with support for Mac OS X Mavericks and minor bug fixes. Happy Mavericks Day. Read more. Charles 3.8.2 released with minor bug fixes. Read more. Charles 3.8.1 released with minor bug fixes and improvements. Read more. Charles 3.8 has been released with new features and bug fixes. Read more. Charles 3.7 has been released. Includes new features, bundled Java runtime (so you don’t need to install Java anymore), and bug fixes. Read more. Charles 3.7 beta 2 has been released. This changes the SSL signing for Charles on Mac OS X to use Apple's new Developer ID code-signing. Read more. Charles v3.6.5 released including bug fixes and minor changes. Read more. Charles v3.6.4 released including major bug fixes and enhancements. Read more. Charles v3.6.3 released including minor bug fixes. Read more. Charles v3.6.1 released including minor enhancements and bug fixes. Read more. Charles v3.6 released including new features, enhancements and bug fixes. New features include HAR and SAZ file import. Read more. Charles v3.5.2 released including bug fixes and minor new features. Read more. Charles 3.5.1 released. Minor bug fixes. Read more. Charles 3.5 released. Major new features, bug fixes and enhancements. Charles 3.4.1 released. Minor features and bug fixes. Charles 3.4 released. Major changes especially to SSL. New website launched. Follow @charlesproxy on Twitter. Say hi in San Francisco when I'm there for WWDC! Charles 3.3.1 released. Minor new features and bug fixes. Experimental 64 bit Windows support. Read more. Charles 3.2.3 released. Minor new features and bug fixes. Charles 3.2.2 released. Minor new features and bug fixes. Charles 3.2.1 released. Minor new features and bug fixes. Charles 3.2 public beta released. Download and more information on my blog. Charles 3.1.4 released. Bug fixes and minor new features. Charles Mozilla Firefox add-on updated for compatibility with Firefox 3.0. Charles 3.1.3 released. Minor bug fixes, minor new features. Charles 3.1.2 released. Minor bug fixes. Charles 3.1.1 released. Minor bug fixes. Charles 3.0.4 released. Fixes SSL bug on Java 1.4. Charles 3.0.3 re-released. Fixes launch bug on computers that haven't used Charles before. Charles 3.0.3 released. Various improvements and minor bug fixes. Charles 3.0.2 released. Minor bug fixes and improvements. Charles 3.0.1 released. Minor bug fixes. Charles 3.0 public beta released. No more recording limits. Large responses are now saved to temporary files, reducing memory usage. Thank you to everyone who made suggestions and participated in the long testing process. Charles v2.0 released. Major enhancements and improvements. by Andrew Bardallis A comprehensive walkthrough of using Charles to observe and modify traffic, including using it with mobile devices. by Dan Grigsby Using Charles to explore the iPhone App Store XML. by Gary Rogers Using Charles to debug the iPhone. by Darren Richardson A great review of Charles from the point of view of Flash developers. by uberGeek Using Charles to find those really annoying Flash bugs in record time.